I feel the same way. Between the K10D/K20D, Nikon D300 and Canon 40D, I find the Canon has by far the worst overall ergonomy. 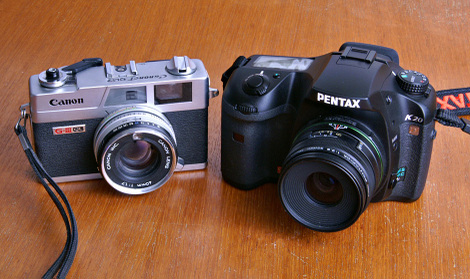 Well, it *could* be a matter of habit, since the Nikon's control layout is somewhat similar to the Pentax's. PS... you're almost up to 3000 posts. Last edited by Lore; 05-15-2009 at 02:00 PM. Steel as in Fe+C? If it's made just from that material then it will be even heavier than the K10D/K20D. No, it will just be smaller. Steel is 4x the density of Mg, but the strength and stiffness of steel is correspondingly higher. The important parameter is the ratio of strength:weight. Therefore, the volume (size) of steel only needs to be ~1/4 of Mg to be the same strength. If sizes/space is not an issue then soft low-density materials such as Al or Mg are suitable because you can use more material to make up for their low strength. Another advantage is they are relatively soft, so they are easy to form into complex shapes which means lower manufacturing cost. If miniaturization is a priority, high-strength materials such as steel or Ti are a better choice. But they are very hard, so it requires great amounts of energy to form them into shapes. I know that dave9t5. I was simply replying to ogl because he stated that the camera will be made only from steel (inner and outer shell) ... that's why I said a camera built only from steel would weigh more than the current K10D/K20D which have a metal inner shell and plastic outer shell. OK guys we're just shy of the official release, and still no solid specs. Come on what are all those Russian spies up do? Do we have to wait for them to sneak into Norway and give us info from the official presentaion ( Where I hope Pal gets his hands on the real deal and posts some real image samples and vid clips ). ( Where I hope Pal gets his hands on the real deal and posts some real image samples and vid clips ). The bold text excites me. It's about time the shutter is quieted instead of the "zip zip" sound. Well, I wasn't saying it's completely made of steel. I was simply questioning ogl's statement. Since he sometimes makes unclear statements. No if it is a composite. Right, Nikon's menus *are* the pits. My money is on "not composite"
Ah, I understand what you were saying. I for some reason thought that the K20d was magnesium. Of course, it is listed as plastic shell with steel frame. If the plastic shell is replaced with steel shell, then the inner steel frame is redundant and can be eliminated. The steel shell becomes the frame, which saves weight and volume. It would explain the squarish traditional shape of the K-7. A (semi-)continuous steel shell would be a much more difficult shape to manufacture compared to either a molded plastic shell or bolted sheetmetal inner-frame. - opens up a lot of space on the interior, so more space for "goodies" such as larger VF, or electronic guts (video circuits, sensor cooling), etc. - increases the rigidity of the body, allowing less material (smaller/lighter). My money is you are correct. To do what I said not only would you have to heat the mold but also the steel skeleton part before you put the skeleton into the mold and inject the plastic. All of this would make it more expensive. If Pentax did do this thou it could be stiff like metal (this is part of why some like metal) and use a softer plastic so it would not crack. This allows Pentax to use the best the 2 materials properties and minimize the 2 materials weaknesses. I have seen parts built like this but mostly to reinforce the attachment (screws) point. ceramic plastic composition with steel chasis. aluminum and steel don't mix because of reaction of dissimilar metals.